SARATOGA, NY—Less than 24 hours after being promoted to staff sergeant within the corruption-plagued Saratoga Police Department, decorated canine unit dog Chips was implicated by fellow officers Friday in a long series of felony misconduct charges, a development that has cleared all members of the force previously accused of the crimes. 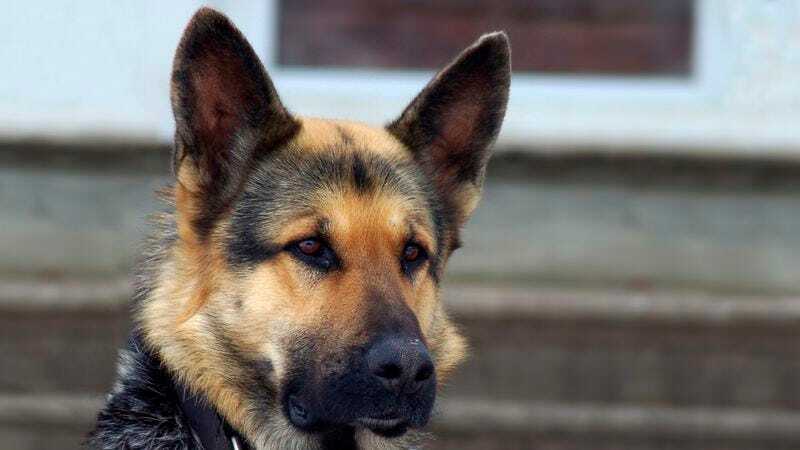 "It's really heartbreaking to see a good dog you admire and respect go down like this," recently exonerated narcotics detective Charles Mitchell said of the 82-pound German shepherd, who had previously been commended for bravery on eight separate occasions and is now being held on counts ranging from harassment and evidence tampering to shooting an unarmed citizen during an investigation. "I felt really conflicted about turning evidence on him, but he was somehow able to steal 18 pounds of marijuana from a bust we worked together and then hide it in my garage, so what was I supposed to do?" Other absolved officers added that Chips' arrest is especially difficult for the precinct after last month's suicide of police horse Ranger, who hung himself from a beam in his stable while under investigation for defrauding the department's pension fund of tens of thousands of dollars.